“What have I gotten myself into?” Elba thought, this was supposed to be a one time thing! But sure enough, the next Sunday Elba was back, sitting in the pews amongst people who would become a major part of her life. Talking about it now causes her to smile, her eyes sparkling as she remembers old memories. As with many of us, Advent is her home away from home, and it has turned out to be something that she could have never regretted. Elba Cabrera has done it all. In her life she’s worked in Social Services and the Arts, had poems written about her and murals dedicated to her. She completed her degree at age 44 at SUNY Old Westbury. She's even traveled around 80 percent of the United States as a Girl Scout Administrator. A few years ago Elba had retired, but being the pro-active person she is, became bored and decided to teach Healthy Living workshops. 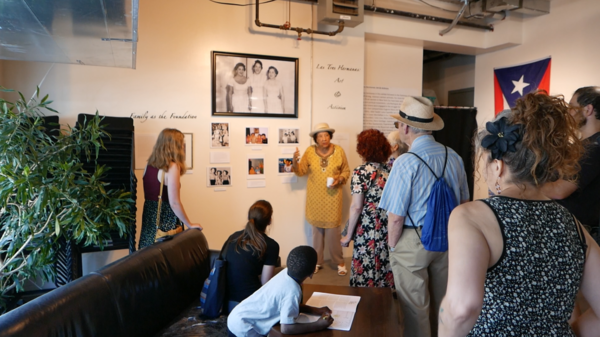 Recently, an art exhibit was created about the impact Elba and her two sisters had on the Bronx community. A few Advent members went to see it, as shown in the picture above. There is still time to sign up! In a few days, members of our congregation will be hiking, petting goats, eating s'mores, and meeting new friends. Spend a night with Advent. Experience God in nature. We want you there because we know how much you will love it. The trip is from August 4-6. Learn more about travel, costs, housing, programming, and registration on our website. It is our pleasure to announce a special showing of the documentary, “Immigrants for Sale,” sponsored by the ALCU, on Tuesday, August 8 at 7:00pm in the Community Room of Advent Lutheran Church. The film will be followed by a panel discussion and general conversation. Please join us and invite your friends and neighbors. Do you love hosting events such as parties and meetings? Then this job is great for you! Talk to Zachary for more information. You can reach him at admin@adventnyc.org. While the Advent Chorale takes a break for summer, there are still opportunities to sing in worship! Summer Choir provides a more laid-back opportunity to sing at 11am worship with just one rehearsal the same morning at 10:15am. Summer Choir will sing August 13. All are welcome to join! Adult Conversation | Meets from 10:10-10:50am in the front half of the basement fellowship hall. This Sunday's topic will be on immigration -- part of our summer series on social justice and advocacy. The Mission of the Month for July is Equipo El Salvador. Equipo El Salvador is our group that visits our sister church in El Salvador each year, and maintains our relationship through prayer and accompaniment.